Adapted from Jamie Oliver in Cook With Jamie. This is an example of why I love Jamie Oliver. A simple idea that is quick to prepare, nutritious and tastes amazing. Jamie uses purple sprouting broccoli. I went for broccolini which I think is just baby broccoli. The stems are lovely and tender, a little like a cross between asparagus and broccoli and just bursting with green goodness. Feel free to substitute in regular broccoli if you can’t get your hands on broccolini. 1. For the sauce: combine rosemary, anchovies and lemon juice and zest in a small bowl. Add a few tablespoons extra virgin olive oil to give it a good oozy saucing consistency. Season with pepper and set aside. 2. Bring a medium saucepan of salted water to the boil. Cook broccolini for 3-4 mins or until just tender. Drain and toss through about half of the sauce. Keep warm. 3. Meanwhile, rub salmon with olive oil and season well. BBQ or pan fry for 3-4mins each side or until cooked to your liking. 4. Divide broccolini between 2 plates. Top each with a piece of salmon and drizzle over remaining sauce. vegetarian – replace salmon with fried or poached eggs. more substantial (carb lovers) – potatoes or cooked pasta or quinoa. more substantial (low carb) – roast almonds, hazelnuts or extra broccolini or mayo. Low FODMAP – use broccoli florettes (not stems) and serve with potatoes. no anchovy – a rosemary garlic oil would be nice instead. carnivore – the sauce is amazing with steak or lamb as well. different veg – broccoli, asparagus, cabbage are all great. rosemary – will keep in a plastic bag in the fridge for weeks. Also freezes well. anchovy – keep them in the pantry. lemons – will keep for a few weeks at room temp or for much longer in the fridge. salmon fillets – freeze them. broccolini – will keep wrapped in a plastic bag in the fridge for about 2 weeks or sometimes a little longer. Can be frozen (if you have time chop before freezing so it will defrost quickly in the pan). Yes for the sauce and broccolini. Just cook as per the recipe but keep the sauce and broccolini separately. Refrigerate for up to 2 weeks or can be frozen. 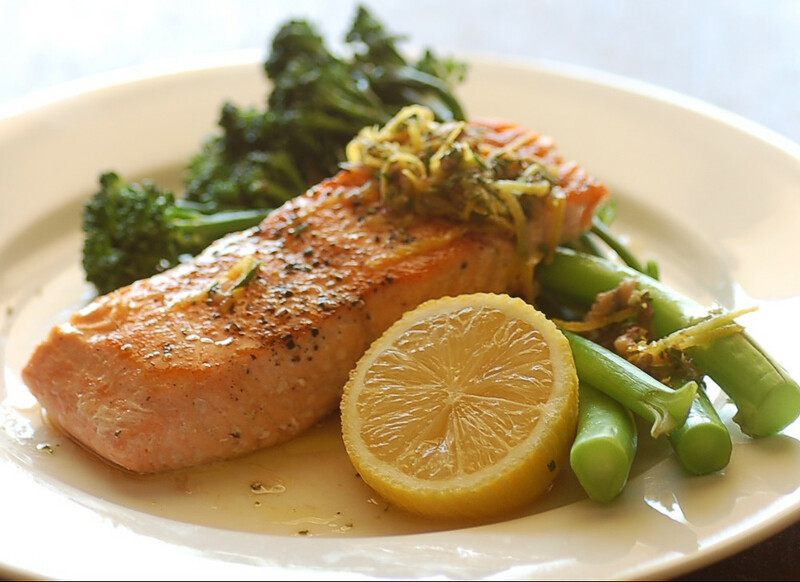 To serve allow broccolini and sauce to come to room temp then cook salmon as per recipe.